This post was sponsored by VitalSleep. The opinions are completely my own based on my experience. Also, this post contains affiliate links. You can read more at our Legal page. Thank you! 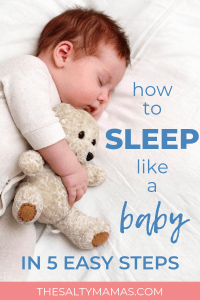 As a Mom, getting quality sleep is like the Holy Grail. Elusive, hard to find, and just when you think you’re about to get it – someone pees their bed. Okay, maybe the analogy went a little off the rails there, but you know what I mean. Between our kids’ nightmares, midnight feedings, bed wettings, growing pains and the classic “need to snuggle,” we are fighting an uphill battle. We just end up more tired and more desperate to get better sleep. Then I realized that I was not helping the cause with my own bad habits. 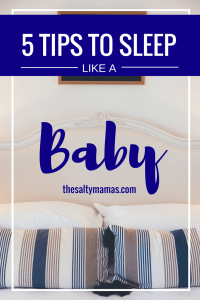 I thought to all the times I begged for advice on how to get my babies to sleep and came to the conclusion that I didn’t follow any of that advice for me. I had no routine. My sleep space wasn’t ideal. I just wasn’t setting myself up for success. All the things I did to help my baby, I should have been doing for myself as well. There’s a TON of information out there about how all our devices keep us up at night. 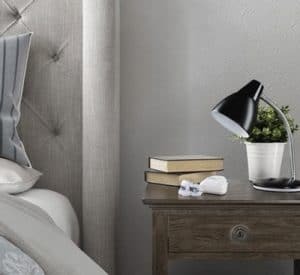 The white light makes us alert, the content keeps our minds active, and there’s never an “end.” So we decided to get rid of all electronics in the bedroom. Before bed, I often read a real, physical book (yes! they still make these!) which makes me sleepy and slows down my brain. Sometimes, we’ll watch a show together, but unlike the internet, it has credits at the end so we can’t go on forever. I never know when someone might wake me up, so getting to sleep in a timely manner is a pretty serious priority. Yes, comfort items aren’t just for babies! Confession: I can’t tell you how many times I have woken up to find myself snuggling with a blanket one of my kids have left in my bed. Darned if those swaddle blankets aren’t cozy! (This is my favorite one to snuggle with). So don’t be afraid to have an item that brings you comfort too! A few months ago, we needed help getting our bedroom organized. It was a mish-mash of craft area, bedroom, library, and kids stuff everywhere. We had an interior decorator come in to help us make a plan. He suggested we get blackout curtains. I scoffed, because I’m basically up before the sun everyday anyway and the idea of the kids waking me up when my room is pitch dark was even more depressing. Then I realized that a lot of light gets in the windows even during the night. And yes, I’m up before the sun but that doesn’t mean it needs to be even a little light in my room the other 8 hours I should be trying to sleep. Now that it’s dark, the sleep I do get is so much better. As people on a budget, and fairly devoted to cheapskating, we sometimes file things away incorrectly as luxuries. For years my husband and I were using the same old sheets we’d had for a hundred years, and bought when we were on a really low grad student income. I think our pillows were $2 apiece. I HATED the way our duvet cover fit our duvet and I’d get tangled up every night. So I tossed the crap pillows, and while we haven’t pulled the trigger on going full MyPillow yet (someday, honey….someday) we decided to invest in nice pillows. And when our flannel sheets get pilly? I get new ones. If I don’t love my other sheets? I get a higher thread count sheet for max comfort. I want to spend at least 56 hours a week in this place, so it is absolutely worth the investment to make sure I’m enjoying each and every hour I can get! It may be one of the greatest clichés of married life, but in my house, it’s a real one. Snoring was a factor affecting my sleep every. single. night. I would lovingly roll my husband over, trying not to wake him up, praying it would make the snoring stop. Sometimes it would, which was awesome, but inevitably he’d roll over again and the dance would continue. I spent a fair amount of time doing a cost benefit analysis of one of those fancy mattresses so I could push a button and raise him up, but that was outside our budget. 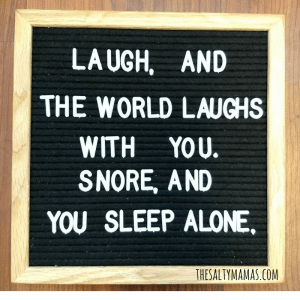 In looking for more reasonable solutions, I found VitalSleep which is a mouthpiece that helps mouth breathers – like my husband sleep snore free immediately. It basically molds to your mouth to adjust your jaw position to open the airway and stop the snoring. And it’s 88% effective which is a MUCH higher success rate than my shove and roll move. And if your partner is in the 12% that it doesn’t work for? Well, my heart cries for you, but at least the good people at VitalSleep will give you back your money with their 60 day guarantee, so you basically have nothing to lose. But some awesome sleep to gain. Yes, the last step is to get the sleep you’ve been dreaming of. Well, the sleep you would dream of if you were sleeping long enough to actually dream. If you’re like I was, you’re day dreaming about it while your eyes are glazed over as you push a swing over and over and over. So go, follow these steps and enjoy! If you’d like to try out the VitalSleep mouthpiece and save on their already low prices use promo code THESALTYMAMAS! I know a lot of people who need that product to stop snoring! Could be a total marriage saver! Sooooo did it work?? I want details on the snoring thing! I kick my husband out to the guest room more times than I’d like to admit, lol. I’ve tried fancy ear plugs and they seem to block out every noise Except snoring. I have no trouble drifting off to sleep, but often my quality of sleep is lacking, I wake up often during the night and often feel tired throughout the day. Normally exercise helps me get a better quality sleep, but on the days I just don’t have time, I’ll have to implement some of these tips.